This weeks Wednesday’s Weekly Savings Tips is on, How To Get Your Bananas To Last Longer! Not sure what weekly tips are? You can read what they are about here. You may be wondering how this is a savings tip. Well if you can get bananas to last longer, it saves you money by them not being wasted. One of the first things you can do to get your bananas to last longer is to never buy them all the same. When you go shopping for your bananas you will see them in bunches. Simply split the bunches up. Buy a few that are more yellow and then buy the bulk of them more green. By doing this it will stage the bananas to ripen them. They next step to getting bananas to last longer is to split up the green bunch that you bought. Take a few of the green bananas from the bunch, and place them in a bag. I like to use the brown paper bags, like you get for packing lunches in. I get them from the dollar store or on Amazon. You can get about 100 of them for pretty cheap. Anyways, after you have put the bananas in the bag, roll the bag closed. Now place on top the fridge or a warmer place in your kitchen. Let it set for a few days. Then when you open it up the will be ripened. Following these tips will stage your bananas. You will have your ripe ones that you first buy, your ripened ones in a few days after placing them in the bag. Then last you will have your green ones that will ripen on their own in three to four days. Now you will know how to get your bananas to last longer! If you end up with over ripen bananas, there are a few things you can do to save those as well. You can use them for making pancakes, breads, put in oatmeal and lots of other foods. Plus you can also freeze bananas. You can toss them in the freezer whole in the peel. Or you can also freeze them the way I like to. I peel the over ripe bananas, then slice them up. I place the slices on a cookie sheet and pop them in the freezer. After they are frozen (3-4 hours) I place them in a plastic freezer bag. Then you can take a few pieces out here and there and use them as needed. 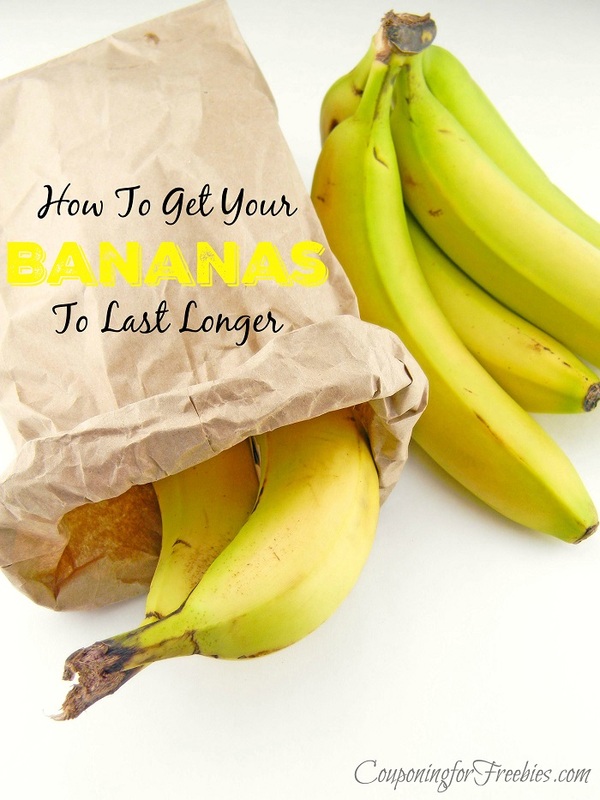 Did you like these tips on how to get your bananas to last longer? Be sure you stop by every Wednesday at 10 am, to see what savings tips we will be sharing with you that week. You will be able to find them all here in our Wednesday’s Weekly Savings Tips category after they are published.